Hip hip hooray!!! 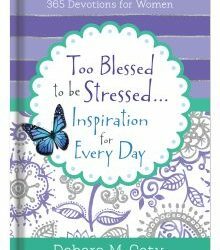 My new 365-day devotional, Too Blessed to be Stressed: Inspiration for Every Day has just officially released and I’m in the mood to celebrate! Won’t you celebrate with me? This refreshing blend of inspiring daily readings laced with encouragement and gift-wrapped in humor took the better part of a year to complete (most of the other books in my Too Blessed to be Stressed line have taken 4-6 months), so I’m a particularly proud Mimi of this long awaited “Baby Blessing.” Get a free taste HERE . Yep. It’s a great way for crazy-busy women to actually feel Papa God’s peace that passes all comprehension every single day of the year. So here’s the deal: Just drop me a LINE that you’d like to be included in the drawing and I’ll send FREE autographed copies to three lucky winners drawn from a hat on January 24. 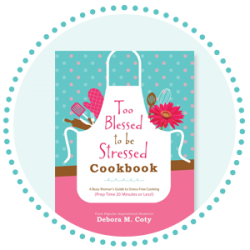 The very first one drawn will also receive a copy of my ever-popular, award-winning Too Blessed to be Stressed Cookbook (100+ delicious recipes that each require less than 20 minutes hands-on prep) to help decom-stress your 2017. I’m looking forward to sharing Inspiration for Every Day with you. It’s really a lovely little book and smaller than most bulky 365-day devos so it’ll tuck nicely into a suitcase or purse for easy mobility. Get your entry in today … the winners will be posted right here on my blog. In other news, I’m terribly excited to announce that I’ve just signed a contract for another Baby Blessing called Too Blessed to be Stressed for Moms, which is set for release in early 2018. A HUGE high five to Papa God! And please – don’t forget to sign up for my quarterly e-newsletter at my newly renovated website. While you’re there, check out the BFF Club – we’d love to have you join our happy little group of girlfriends! I would love to win this! I have almost all your books! Thanks for all you do. I would love to win one of these new copies. I love you and your books. You’ve been such a blessing and inspiration to me.